Now in its fifth year, the World Economic Forum’s Global Energy Architecture Performance Index (EAPI) ranks the performance of countries’ energy systems, as well as looking at trends in the global energy transition. 1. Economic growth and development – the extent to which a country’s energy architecture, or how its energy is sourced, supplied and managed, adds or detracts from economic growth. 2. Environmental sustainability – the environmental impact of energy supply and consumption. 3. Energy access and security – the extent to which an energy supply is secure, accessible and diversified. The index benchmarks the performance of national energy systems, in order to enable comparisons across countries and by highlighting strengths and areas for improvement, the index can inform energy policy-making. 1. Switzerland tops the rankings for the third consecutive year. It scores highly thanks to its diverse mix of energy supply, its low-energy intensity (a measurement that shows how well an economy is using its fuel sources) and its low emissions. However, its score in diversity in energy imports has gone down this year. 2. Norway ranks first on energy access and security and also scores well on other dimensions of reflecting how it has successfully translated a large supply of natural resources into benefits across its entire energy system over time. 3. Sweden was once heavily reliant on oil, but a sustained programme of investment has seen it gain one of the highest shares of renewables in Europe. It has already reached 50% of consumption from renewable energy. It beats both Switzerland and Norway on environmental sustainability. 4. Denmark scores eighth on economic growth and development, and has achieved low levels of energy intensity as well as competitive energy prices. 5. France, the only G20 country in the top 10 of the index, is speeding up its energy transition following the implementation of the Paris Agreement. This includes diversifying its nuclear-dominated electricity mix, reducing its emissions and strengthening its security of supply. 6. Austria rose from eighth place in 2015 to sixth in 2016 where it remains this year. It is committed to a target of 34% share of renewable energy by 2020. One third of Austria’s final energy consumption was derived from renewables in 2014. 7. Spain’s strong performance is due to factors such as the high diversity of its fuel mix and import counterparts, as well as the low energy intensity of its economy. The country has recently implemented broad and deep electricity market reform which fundamentally changed the remuneration scheme for renewable energy. 8. Colombia is the first non-European country to appear in the top 10. It has a large supply of natural resources, and is therefore at an advantage in being able to boost its economy and provide its population with secure, low-cost energy. Colombia is also a net exporter of energy, reflecting the surplus of its natural resource endowment. 9. New Zealand holds on to ninth place in this year's report (it was ranked 4th back in 2015). It is only the second non-European country to appear on the leaderboard, and scores particularly highly on energy access and security. 10. Uruguay has made great strides in its energy sector performance since 2009, having formulated a long-term direction for its energy sector and committed significant investment to this transition. Top performers share a number of characteristics. 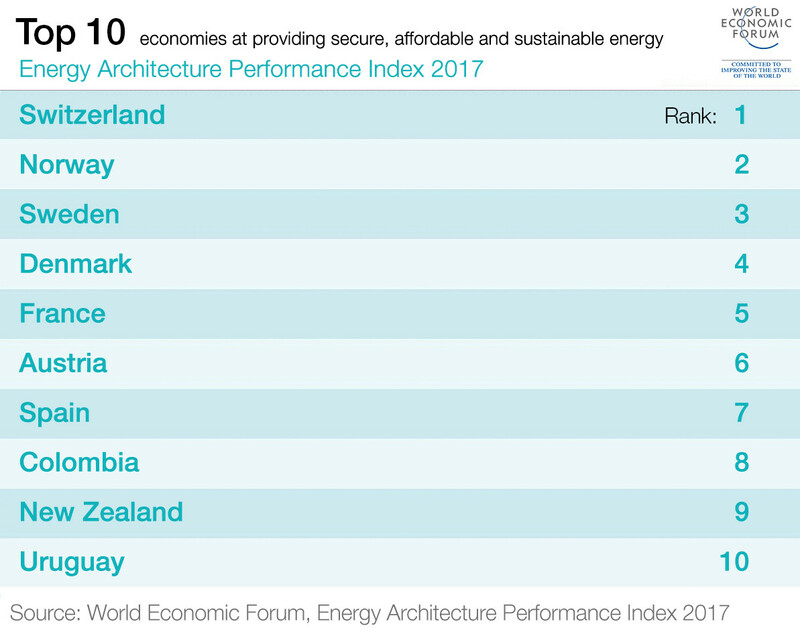 They tend to be smaller countries – for example, Switzerland (1st), Uruguay (10th) – which makes it comparatively easier to enact changes in their energy systems than in those of larger countries. 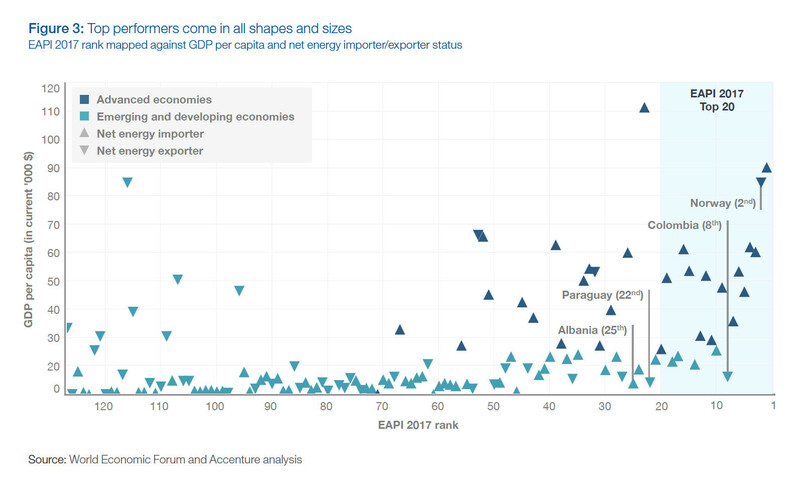 Most of the highest performers are also advanced economies, defined principally as having a high level of gross domestic product (GDP) per capita, diversified exports and being well integrated into the global financial system.